Many thanks to D.Andy for its help on this page! 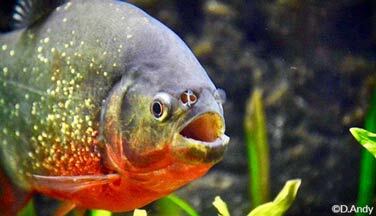 This beautiful Piranha should not scare you. Did you know that it is actually calm and rather shy? 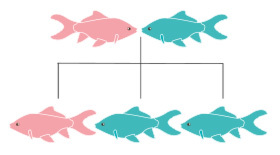 These gregarious fish form groups as beautiful as fascinating. 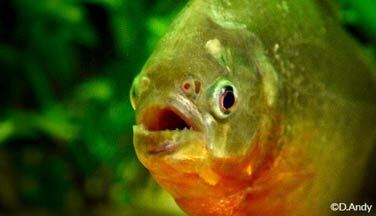 Do not be afraid and immerse yourself in the fascinating world of the Piranha!! 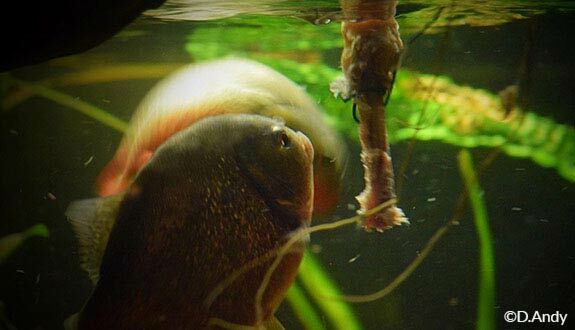 How to feed the Red Piranha? Predator: live or dead prey. The basic diet will consist of big-scale sand smelt and frog legs. 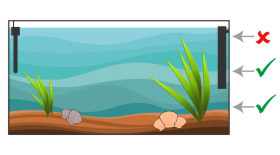 You may supplement from time to time with mudsworms, earthworms, shellfish and cooked molluscs, insects and larvae. Do not give them mammalian meat like beef because lipids are not metabolized well by fish, which causes excess fat and damages their organs. 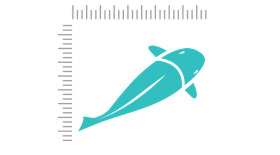 We must also avoid feeding small fish like Guppy or small goldfish. Indeed, this kind of diet based on raw fish destroys vitamin B1 in the body of Piranha, which generates a significant deficiency and therefore weakens the health of the fish. What kind of behavior does the Red Piranha have? 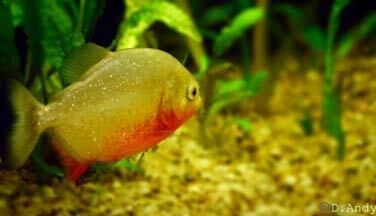 Contrary to what one might think, the red Piranha is rather shy, calm and discreet. Another appreciable quality: it does not destroy its decoration. 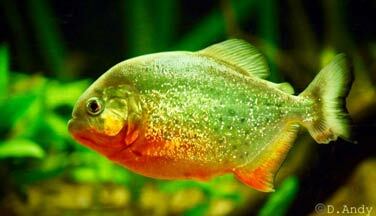 On the other hand, if it lacks food, the Piranha becomes aggressive and attacks its congeners. They can mutilate themselves or even kill each other. This behavior will be the same if a group member is weak or sick. In general, it is the smaller individuals who will be victims of this aggression. 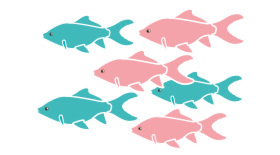 The group moves as a shoal to protect itself from predators (and not to attack large prey). 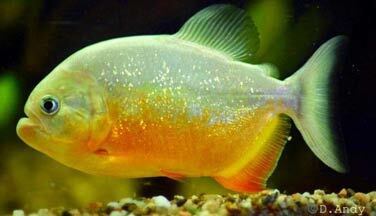 Who can live with the Red Piranha? 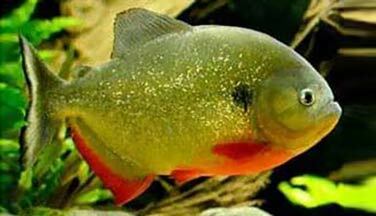 Piranha can tolerate the presence of Danios, Rasboras or shrimp of the genus Neocaridina Davidi. It can also be associated with a Pleco (Hypostomus plecostomus). 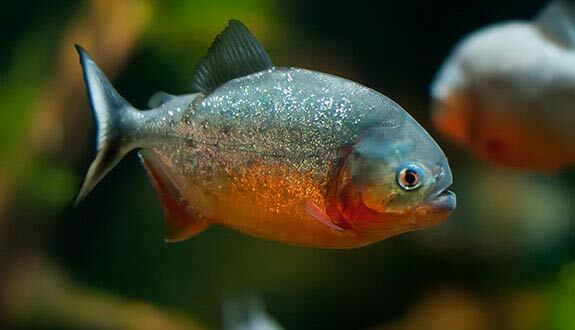 How to breed the Red Piranha? Its breeding is relatively easy. Note that sexual maturity is reached around one year of age. Spawning can happen in the maintenance bin. 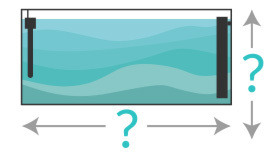 Place large pebbles at the bottom and hold the temperature at 24/26°C or 75/79°F and the pH at 6.5. Sift the light. 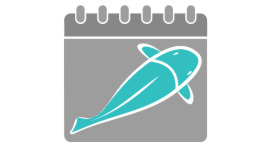 A big change of colder water can help with spawning. The male digs holes and the female lays the eggs. The male keeps the holes containing the fry, even if sometimes the female also fulfills this role. A laying can range from 300 to 400 eggs. The incubation lasts 36 hours. As soon as the fry appear, and with the greatest caution, siphon them to raise them in a smaller container. The fry must be constantly satisfied: you must feed them several times a day. Also change 10% of the water daily. When they reach 1.5 to 2 cm or 0.4 to 0.8 inches, they attack each other, so you need to sort them according to their size and place them in different facilities. Fry food: artemia nauplii, then fine zooplankton, chopped tubifex or chopped fish. 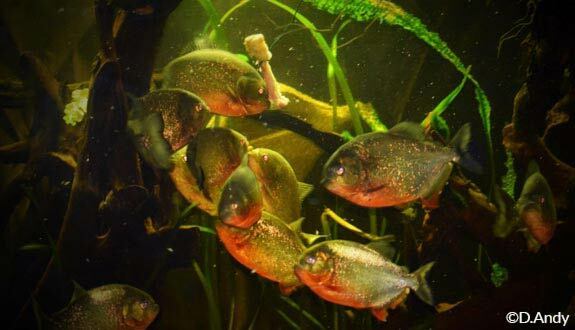 Although breeding Piranha is easy, think carefully before you take this step: it requires significant facilities, and you could end up with hundreds of fish that are difficult to sell. Which aquarium for the Red Piranha? Some aquarists maintain this species in bare bottom aquariums for ease of maintenance, but a sand or gravel substrate is more appropriate for their well-being. Do not forget that this is the basis of an Amazonian biotope species! Its ideal tray is well planted and has large roots. Have as many hiding places as fish, to avoid the fighting for the same places of folds. They will stay there for a long time without swimming. Floating plants will also be welcome as the Piranha does not like strong lighting. Leave a lot of free swimming space, for example by concentrating your plantings on the sides and bottom of the aquarium. 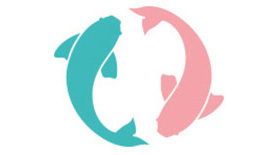 Who says big fish says big polluter. 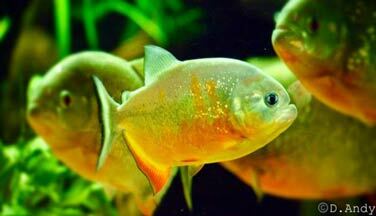 It will therefore be necessary to provide a very powerful filtration, or even several filters (if possible, the heating will be integrated in the filtration because the Piranha is known to damage the material immersed, as the installation of a sump for example). Change 15 to 30% of the water each week, taking care to siphon the soil. 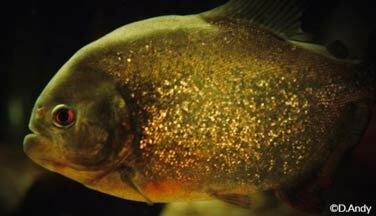 There are many stories and legends about the bloodthirsty behavior of Piranhas. Rest assured, they are highly exaggerated and often unfounded. In nature, it is an opportunistic scavenger and a harvester more than a true predator. Nevertheless, caution is still needed with this species (a group in a closed space during drought can be effectively dangerous and attack large prey). The red Piranha is therefore to handle with care. Its bite can potentially cause serious injury even outside of the water. So do not surprise it by putting your hand in the aquarium! With some precautions, it remains harmless during the maintenance work of the tray: folds flat when it gets stuck and it bites only if you try to touch it.